anneliese kliewer: exercise + entertainment. this is what we've been doing. this is where we've been doing it. shawn has been excited to play disk golf. for a while. thanks to grandfather, his wish has been granted. two new disks + we found one. we now own a total of 3.
shawn was giving me a 2 point advantage. he has now lowerd it to 1.
we have learned not to compete with the sun going down. spent some time looking for the disk we had just found. i'm enjoying the 1+ mile walk & the arm workout. do i need to learn a left handed throw? i'm terrible at this game, but grant loves it. i'm with you on the 1+ mile walk thing though. i like to accompany him every round. ps. left handed?! you brave girl. i was quickly clicking through my internet daily five. you know: gmail, facebook, j&l's blog, celine's blog, your blog. and i started reading "celine's." i thought, "whoa...celine! 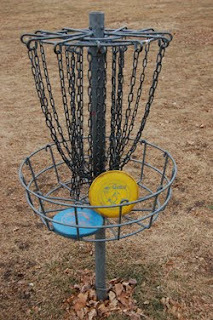 i'm so proud of you for playing frisbee golf with vance (and a baby)." then i read the part about shawn talking about it. and i thought..."hmmm...shawn must have said how much he liked it while we were all together at labor day. that's cool that they tried it." and then i read the part about grandfather. and i thought "who is Celine's grandfather? grandpa reimer??" HAHA! wow. that is awesome. so awesome. ps. daily 5 is so my school vocab. you mean you were reading to self? or maybe to a partner? sitting eek? wow. school nerds.